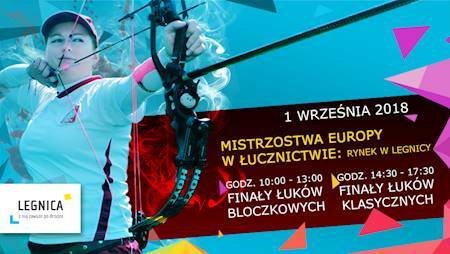 LEGNICA 2018 EUROPEAN ARCHERY CHAMPIONSHIPS - 1st September, Square Market in Legnica. Buy your ticket for the finals now! Over 300 competitors from 40 countries will compete for the champions titles in the recurve (Olympic) and compound division. There will be 60 medals awarded for performing in individual, team and mixed teams competitions. Great Final will take place on 1st September on Square Market in Legnica, from 10:00. Following the finalists’ struggles, supported by live commentary, close-ups of targets and archer’s faces in a videowall, as well as cheering the audience will be an unforgettable event in the history of Legnica. The place where the finals are staged is also important – the building of the Old Town Hall, Hearing Houses and the Cathedral will be a great background for this event.